Update Services. WordPress will automatically “ping” an update service site whenever you publish a new article. To take advantage of this feature, go to Settings>Writing and copy the following recommended services into the text box and save your changes. Will your WordPress site be just for casual blogging, or will it be an entire website representing your company/brand etc. The more important your website, the more important the theme decision. Do you expect your website to be growing in scale and complexity? If so, you may want to consider a theme that has a robust framework to allow you to add additional functionality seamlessly. How technically savvy are you? If you are not technically savvy then you will want your theme to be able to do the “heavy lifting” for you without having to edit any files. What support offerings are available if you use the theme? Does the developer offer email, chat or phone support? Is there a robust knowledgebase/FAQ section on their website? Does the developer offer a forum that is actively used/monitored? I recommend the following themes/theme frameworks for your WordPress blog setup. I currently have major websites running on all of these themes. Genesis – The framework/theme that I use for StartGrowProfit.com. Very flexible and fast wordpress theme framework. Yoothemes – Another versatile theme provider. Has themes for both Joomla and WordPress. Woothemes – Nice framework with robust functionality. Also has free themes. Note: When you are first starting out, it is perfectly reasonable to use a free theme. Just be aware that as your site grows in importance and stature, you will probably want to upgrade to a more robust, well supported theme…and changing themes can be an involved process. WordPress, by itself, is a very capable system. There are, however, times when you need to extend the functionality of WordPress by using plugins. There are thousands of plugins available for WordPress that can help you accomplish almost anything that you can dream of. Note: Because plugins are not part of “core” WordPress functionality, their use does involve some risk. Plugins may interfere with eachother. Plugins may open you up to security vulnerabilities. Plugins may make it harder for you to upgrade to the latest version of WordPress. Plugins may not be supported/maintained/updated. Installing plugins in WordPress is extremely easy. You simply find the Plugin that you want to install and download it to your local drive. In the WordPress admin, you then can go to Plugins>Add New>Upload and select the zip file that you downloaded previously. You then activate the plugin, change any settings that the plugin manages, and you are ready to go. For beginning websites, I recommend only two plugins: Akismet and WordPress SEO. As your needs grow, there are several other plugins that you may find of interest, but I always try to minimize my use of plugins. Akismet – If you open your site up to commenting, the Akismet is a must have plugin. Akisment is a very robust spam filter that you will find indispensable. Akismet comes pre-installed on your new WordPress installation. All you need to do to use it, and obtain and enter a WordPress API key. WordPress API keys can be used on multiple websites, so if you already have one, you just need to enter it. If you need one, simply go to: https://akismet.com/signup/ to request one. Yoast WordPress SEO – – Yoast’s SEO plugin is a highly recommended plugin to help manage virtually all of your WordPress SEO needs. The plugin will help you manage virtually all of your WordPress settings that will impact your SEO. It also helps you optimize your individual posts by allowing you to set your title and meta descriptions, your image settings and more. It even evaluates your individual posts (keyword density etc.) for your chosen focus key phrase. This WordPress Blog Setup article is part 2 of our series on WordPress configuration. 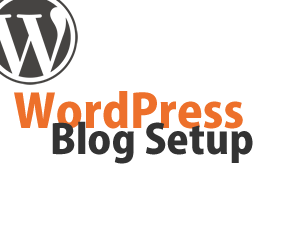 In Part 1 (How To Setup A WordPress Blog) we cover installation and configuration settings. Did you customize the theme for this site? If so, was it difficult?